Deep packet inspection boxes spy on staff. Enterprises using Cyberoam deep packet inspection devices could have traffic intercepted by anyone using its shared certificate. Tor Project security researcher Runa Sandvik and OpenSSL's Ben Laurie discovered the devices used the same Certificate Authority certificate and private key. That gaffe made it possible for any DPI box to grab traffic from employees monitored by Cyberoam devices. “It is therefore possible to intercept traffic from any victim (employee) of a Cyberoam device with any other Cyberoam device — or, indeed, to extract the key from the device and import it into other DPI devices, and use those for interception,” Sandvik said in an advisory. 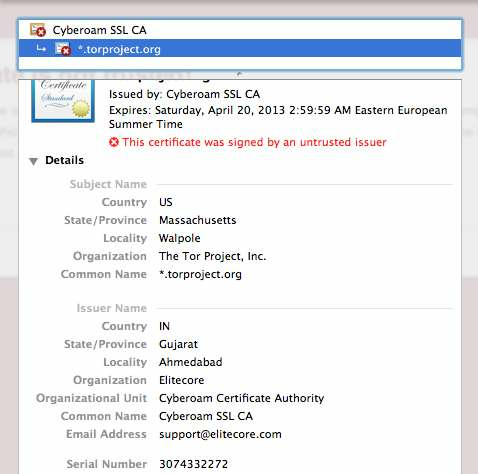 Sandvik and Laurie began researching the hole after a Tor user in Jordan reported seeing a fake Cyberoam certificate for the TorProject.org. They discovered the user’s traffic was intercepted by a Cyberoam device. Trusted certificates had to be installed on employee machines, referred to as victims, in order for DPI to work. But that Cyberoam victims all installed the same trusted CA which would issue fake certificates was “a little surprising” Sandvik said. The company acknowledged the vulnerability and said it would investigate. The company has been contacted by iTnews' sister publication SC for comment. Users can delete the root CA by following these instructions.